I love love love dresses! All mine are black, pink or blue. Somehow I don’t have any here with me so it’s polyvore again I’m sorry. Today I’m featuring my future yellow lace dress. This is a dress I’d be prepared to learn to sew for. 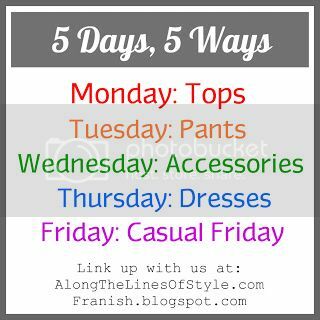 Today is accessories on 5 Ways 5 Days. Here is mine. I have a bag just like this and therefore can have outfits similar to these. Fun! It’s pants today – I normally prefer wearing skirts rather than pants and don’t have too many in my wardrobe. I do have a pair of bright blue jeans though so that is what I chose to base this day on. I would love to have a purple bag so I can look like outfit three – and perhaps a houndstooth bag too please. 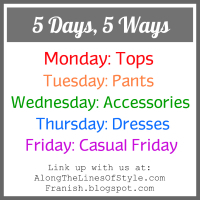 I’ve just discovered a fun challenge for the week called 5 ways, 5 days at franish.blogspot.com. The idea is to post 5 different outfits using the same item of clothing. 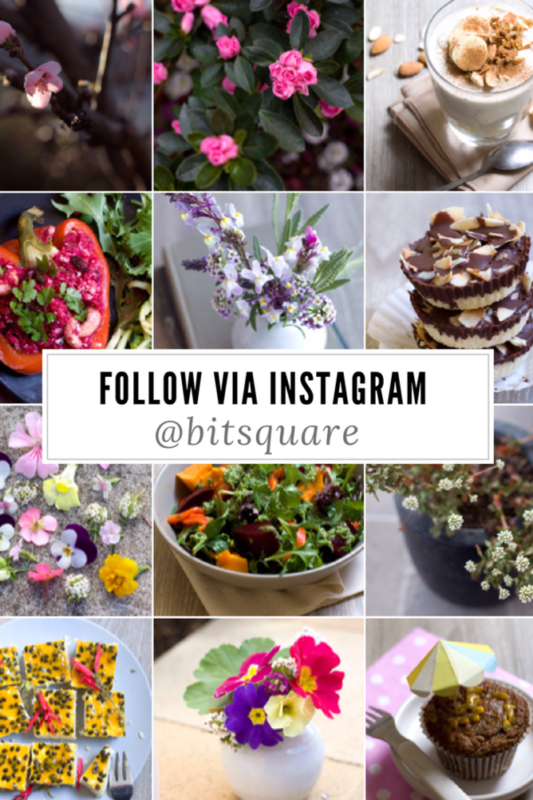 Each day of the week is to feature a different item. This is a bit of a cheat as I’m moving houses at moment and living out of a very small wardrobe of mainly work clothes (all black and some white) – so unfortunately I’ve had to resort to polyvore. I have however chosen a top like one I own and outfit combos that I would (or hope to) wear. It has been fun and given me ideas to try next time I wear my red shirt! I love red shirts. I’m sorry I’m using polyvore.